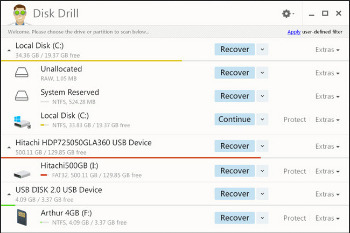 Recover Deleted Files with Disk Drill portable. It may seem complicated, but it’s not. With Disk Drill for Windows your data can be recovered in a matter of minutes. Any storage device you can connect to your Windows PC can be scanned by our data recovery software. We guarantee fast, convenient and secure file recovery. Disk Drill is a comprehensive and effective piece of software designed to offer you the means of analyzing internal or external data storage devices for lost or damaged files, helping you recover them in just a few swift moves of your mouse. There are endless possible cases when data can be lost. Disk Drill for Windows comes in handy every time: accidentally emptying Recycle Bin, virus attack or power failure, partition damage, failed bootups and more. Once installed, Disk Drill scans your media with lost data and scavenges recoverable data out of it, or discovers lost partitions that may be recovered intact. With smart detection of bad sectors on a drive’s surface, you increase your data recovery chances. Was your data lost just a few minutes ago? On Windows, your chances of recovering it through Quick Scanning are much higher if you act fast. Usually when a file is deleted, it’s only the name that’s marked as removed. The contents of it is still there on the drive. Quick Scan takes just a second to bring the list of recently deleted items to you. Disk Drill can also take a longer route and dig deeper. Deep Scan will reconstruct lost files and restructure them back for you based on their binary structures. More than 200 file signatures are known by Disk Drill’s Deep Scanning module. With Disk Drill your data is also protected. Enable Recovery Vault even if you’ve never lost the data yet. It will keep your files protected from accidental deletion by keeping a copy of the properties of each file and folder being deleted on your computer. When such a database exists, it’s only a matter of a few seconds to recover any erased directory or file array. All the original file meta-data stays intact. Keep in mind, to use Recovery Vault, you need to enable data protection first.